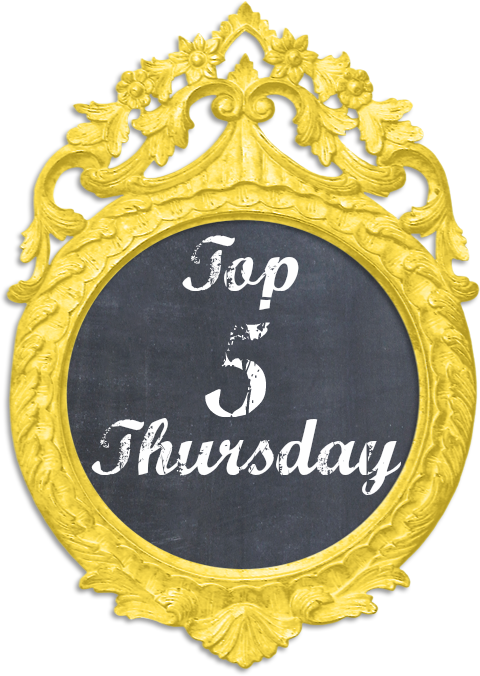 Hey guys welcome back to another Top 5 Thursday! Sorry I have been kind of MIA this week. I will explain that in tomorrow's post. Today we are going to talk about my Top 5 Christmas/Holiday décor ideas. I love this so much! It is so "wintery" instead of "Christmasy" so it is something you could leave up for the whole winter season. It also uses simple trays from Dollar Tree! This is so beautiful and so simple. Just several pillar candles on a cake stand surrounded by berries. This is another "wintery" décor idea. This is so rustic and gorgeous. I love how they use the wreath to be the 'O' in 'Noel'. And I love the white and greyish coloring. What I love about this one is how they incorporated the cheaper Christmas bows and the perfect holiday candies. It is really simple, but has a huge impact! I love the idea of adding some holiday décor to your every day décor like this. Just adding the ribbon, small wreaths and letters makes such a big difference to the mirrors. So there you have it, my top 5 Christmas/Winter décor ideas. As you can probably tell, I am more into the wintery décor so that I can leave it up even longer. I really love the simplistic and rustic looks as well. What are your favorite holiday décor ideas? If you want to check out more of my favorite Chrismtas/Winter décor ideas you can check out my Christmas Décor board on Pinterest.